Walking on untouched high elevation glades. Dark woodlands that open out to wide clearings. The awesome perspectives of the Garhwal Himalayas. Pokhara is the heart of Nepal as a native country is a beautiful example to get the chance and travel around the valley. Crowned by the biggest part of Everest, Imprints of Nepal is a mesmerizing treatment to give delights your eyes. Covered by “Rhododendron” this is the ‘National flower of Nepal’. Nothing can be the best place then Pokhara to start Annapurna base camp which is one of the best camps in Nepal. In ascending way to hill may increase your willpower to climb but the roller-coaster journey will keep reminds you to be one of the best. Annapurna is the 10th highest mountain in the world, most visible peak is there called ‘Machapuchhre’ in Nepali which stands for Fishtail. All Green valley imitates the sign of happiness and open possibilities for explore; waterfall flattering the admirable contrast beauty of the trail with the perfect color combination. The Heart of Nepal ‘Pokhara’ is the most viewed and admirable beauty as well as vibrant culture of Nepal. Flew towards Kathmandu can be the lifelong Novel story for you, cause Kathmandu is not what we think through internet sources it’s a live experience which everybody should take once in a life. The folktale speaks a lot about the name behind “KATHMANDU”, which is come from ‘Kashtamandap’ explained as wooden accommodation construct from Sal tree around approx 12th century. Religious emotions can invite you in the place of Lord Shiva known as Pashupatinath Temple, one of the identifier masterpiece Nepal is having. While being the top of the trek inevitably you’ll get the reason behind why Monks are a devotee for the mountains, why they chase the silence of the universe. Because you can visibly see how the time is passing by through listening to every beat of air sound and your heartbeat as well. Time taken: From India to Nepal then through the way of Kathmandu will reach in Pokhara. The first day use to be with full of enthusiasm and excitement, Ghandruk valley is named on the village of the trail. That will be the first terminus of the day, Nayapul to Pokhara needs 2 hrs to travel from the bus. Birethanti village is linked up through a holdup bridge on Bhurungdi River. Following up Nepal government’s rule and gone through the official procedures on Birethanti village. Next step door will be Ghandruk on an uphill pathway, over the circuitous route Modi river Compile the valley with Syauli Bazaar. Through enjoying the splendor clicks of the hills will reach Kimche, ascending tors buzzing up towards Ghandruk. After reaching up in gatehouse admire the beauty can reconnoiter it with cultural dance music and ethnic essence. The journey will continue on the 3rd day towards Sinuwa, yesterday’s memory still will be linking up on the mind. Keep the river leaving behind and moving a step ahead on gigantic hill peck. In the direction of river steepen out on the way of kimong river bridge walk; will take you in Gurung village, Chhomrong crossing Jhinu Danda. Over covered with rhododendron and oak forest approving the eye stocked view in Bamboo village, which has the only reaching source throw-out wooden bridge. Sourcing of raw material for construction of the villages from nature, they depend on nature to bless them with full of wealth and food. Day 3 destination is here at Sinuwa. Set the destination for day 4 is Deurali, slow steps can be continued till bamboo passing, through the hard rock steps on the stairs will move you on Dobhan. The story behind to call this village Bamboo is actually the Bamboo sticks. Holdup hanging bridge connect Khuldhigar to Bamboo, the valley is constructed by nature perfectly it almost seems a craftsmanship of nature cause when you’ll reach towards Hinku Cave Rock shelters are there since decades. Today’s journey will stop at Guesthouse in Deurali. Finally, the day has come to move on the way of Annapurna base camp. We’ll climb today for cover ABC and stay will be there as well, walk like a slow exercise will be beneficial and appropriate for day 5. Following up to Modi River will guide you to take Bagar. Machhapuchhre (6,993 m) is a worthy Splendor view; Nepalese explain about this peak look like a “Fishtail” that’s why localities said “Machhapuchhre” in Nepali. Every view of Moment will provoke you to capture in your camera as much as you can, following hills are visible from there Hinchuli (6,441m) Manaslu(8,156m) then finally Annapurna(7,937m) respectively. The stream serves you Annapurna sanctuary while following the way to Annapurna south camp, here you can get 360° panorama shot covered with snow bail hilltop. The day will end on Annapurna base camp. It feels like taking a step back the time we had gone through while trek the same destination points will be covered like through Bagar-Deurali-Dobhan and then Bamboo. Chapped hills are still calling back to be there for a while but trek instruction should be followed. Through back, blinks were tickling on the mind to go back and recollect the memory again. 6 hrs journey covered with breakfast, lunch water and walking, rhododendron jungle reminds you of the sweet hrs of trekking. The day patched up in a beautiful Bamboo village. Today again you’ll get the chance to explore Gurung village; the most striking facts about this village is culture, food, and cultural dress. Gurung tribes are the reason to called this village called Gurung village. Back to through Chhomrong river bridge which is the way itself to Sinuwa, passing by snake track way Jhinu danda will wipe out your stress by treating hot water therapy. Hot water spring is the place where you can enjoy after hectic walking schedule. After hot spring bath going to lodge is like a cherry on cake cause habitually you need rest after that, so stay will be in Jhinu danad. After daily trekking routine will be the break after reaching in Pokhara, so today our destination reach is Jhinu Danda to Pokhara. Chasing Modi river through rhododendron jungle the valley will drop you Syauli bazaar. Farming and tourism is the only source of income and feeding, an art of cultivating grains is another experience to get. The rugged pathway will end up on Syauli bazar, the bridge on Bhurugndi river will navigate till Nayapul where trekkers can get the private convenience or bus. Within the 2 hrs, trekkers will be in Pokhara to explore is city and intake the clicks as much you can cause this place is the perfect combination of developed town with full of compulsive beauty of nature. Trekking on Annapurna Base Camp pass is a different kind of adventure where you required to be physically and mentally prepared for the best and worse, at the same time. While high altitudes treks making it tough to breathe, the beauty of those pristine mountains leaves you speechless so that you forget to breathe for a moment or two. In addition to the physical and mental preparation, there is a certain aspect of the health that is needed to be considered on the first hand when you make up your mind about the trekking at Annapurna Base Camp pass. Trekking at Annapurna Base Camp pass demands endurance and fitness and those who suffer any kind of physical or physiological ailments are advised not to go for high altitude treks in the beginning. To get assurance about the trekker’s fitness, we comply with certain aspects of the being fit such as BMI (Body Mass Index) along with the fitness proof since we can’t put the trekkers into the risk. Monitoring the health is one thing that is conducted regularly during the Annapurna Base Camp pass by the trek leaders which includes the monitoring of your blood pressure, oxygen level and pulse rate. Details of your health during the trek is maintained in the health card on the regular basis. Health card can be collected from the trek leader at the end of the trek. 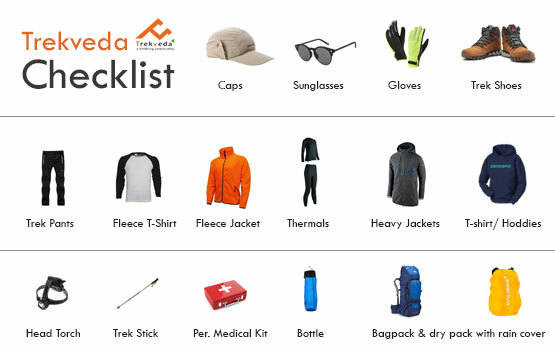 Trekveda provides you all the necessary equipment for trekking at Annapurna Base Camp Trek from tents to ropes. In addition to that, our trek leaders also ensure the safety by various safeguards they take from time to time for your safety. Microspikes are provided to attach to your shoes which help you to keep the traction on the snow and make it easier to climb. An additional gaiter is provided to cover the snows which prevent the entering of snow into the shoes. Customized tents are provided to the trekkers which ensure the warmth and temperature 10 degrees higher than the outside coupled up with high-quality sleeping bags which can endure the temperature up to 15 degree Celsius below the freezing point. Trekveda, keep all your nutritional and hydration requirements on its checklist, our trek leaders will guide you to keep your body hydrated on the high altitudes Annapurna Base Camp pass as de-hydration can attract to the severe medical emergencies while trekking. What Trekveda has to Offer in Case of Medical? Problems like Acute Mountain Sickness can prove fatal at Annapurna Base Camp pass if not taken into consideration seriously on time. If you face any of the symptoms such as a persistent headache, fatigue or weakness, nausea, dizziness, loss of appetite, difficulty in sleeping, you shouldn’t let it go or treat it by your own either just inform your trek leader. 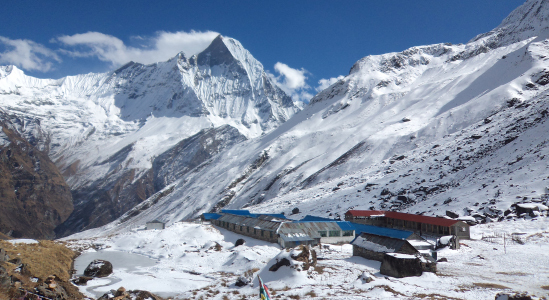 Annapurna Base Camp pass trek is a difficult trek which is suitable for experts. Who have at least physical and mental conditioning for doing the difficult trek. Getting to the Annapurna Base Camp pass trek without proper preparation is something you should never do. Cardiovascular exercise is one of the most sought-after methods which provides not just the physical endurance but also the strength to withstand any unavoidable circumstances sternly. Trekking at Annapurna Base Camp pass trek demands the high endurance which you can develop in few months depending upon your physical condition, where you need to begin with the jogging or running (only if you could do). This practice needs to be combined with the speed and distance targets. You need to keep on increasing both with the time. Begin with a target of completing a distance of 5km in 35 minutes and then gradually increase it to 7 km in the same time and remain stick to this practice until you are able to cover 10 km in 50-60 minutes without fail, at a stretch. Another vital area of improvement, you need to work upon. Before you head to the Annapurna Base Camp pass trek, you need to have the physical strength in order to carry backpacks on the uneven terrains. Considering everything under the sun, you ought to prepare yourself for the core strength. A strength would be making you suffer less than others who don’t prepare before it. To pacify yourself or any other companion, yoga and meditation are the keys. These practices not only give you the mental peace but also provide you with a placid inner conscience which is extremely important in order to withstand the cons during the Annapurna Base Camp pass trek. Try to cover 5 KM in 55 minutes, When you start preparing. The trek expense of Rs. 19,800 + 5% GST takes care of all expenses of the trek from Lohajung to Pokhra. Backpack offloading charges - If you wish to offload your backpack, there will be an additional charge of Rs. 5,000 + 5% GST. The backpack cannot weigh more than 9 kgs. Buffer day – It is mandatory to have this extra day as any bad weather or rain will delay your pass crossing. If buffer day is utilized, you will need to pay Rs. 3,000 + 5% GST. This amount is to be handed over to your trek leader. 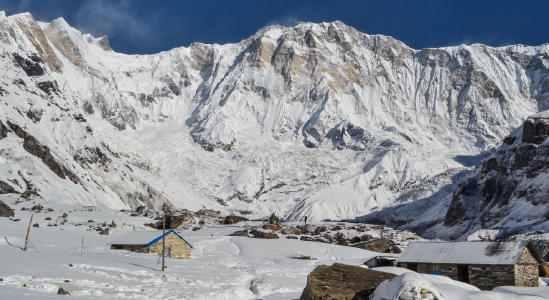 What is the average Annapurna Base Camp temperature is? How many days Annapurna Base Camp trek will take? The Basically it’s a 8 day trek which is followed by tour guide but due to any emergencies like heavy rain or snow fall we’ll shuffle the days accordingly. 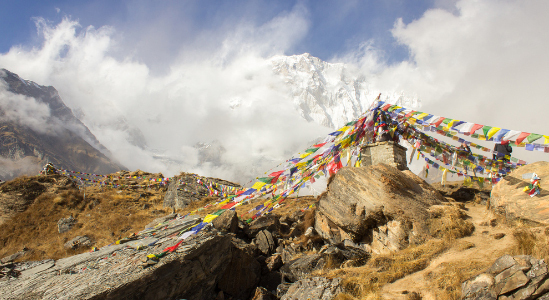 Annapurna Base Camp offers the gorgeous pine forests and maple trees for which this trek is famous, with stunning meadows and streams lining the trail will surprise you with its beauty.
. What is the height of Annapurna Base Camp Trek? The Annapurna Base Camp height varies with every phase you pass as your approach the Annapurna Base Camp trek, you will acclaim a height of around 8,091 mt. What will be the base camp of Annapurna Base Camp trek? Trekveda makes its basecamp at Gulling top. This is one of the most beautiful places that leads to you to the pristine areas while letting your relish the vibrancy of nature. How do we reach Phokhara? In the year of 2014 Delhi Transport Corporation (DTC) start a direct service Delhi to Kathmandu. This would be the money saving idea but it’ll take more time then via flight. Varanasi to Kathmandu- Train and buses are available. Via the Sunauli Border Crossing- Through Gorakhpur which is the most busy route. Sunali border to Bhairahwa. There are frequent connection to Karhmandu, Pokhara and Lumbini. Via the Raxaul Border Crossing- It connects to Birgunj central Nepal from Bodh Gaya Bihar. This route will be convenient for Bihar and Kolkata people cause there is a direct train Kolkata to Raxaul. Via the Panitanki Border Crossing- Through Kakarbhitta nearest for all the north east like Darjeeling, Kolkata, Sikkim. Vehicles can move towards border siliguri , Kalimpong & Gangtok in Sikkim 24 hrs open rout will take Pokhara in 15 hrs anf for Kathmandu 14-16 hrs. Via the Banbasa Border Crossing- It’s in Uttarakhand, most quickest and safest as well but rural way to go. Through Bhimdutta it’ll take 15-17 hrs to reach Kathmandu. Availability of this route is 24 hrs with can connect through Barielly-Rudrapur-Haldwani-Bhimdutta. Your accommodation at Phokhara in the beginning and the end at the guest houses where you’d be sharing the rooms with the fellow Trekkers. Food and stay cost is include in your trekking package in Guest house. The stay on the other days will be in the tents which will be provided by the Trekveda. Each tent will be shared by three fellow trekkers however special arrangements can be made on request. A separate tent will be assigned as the toilet room at each campsite. Any additional baggage (without valuables) can be left behind at the Phokhara. No, you can’t take your child on Annapurna Base Camp trek, cause the difficulty level is a bit high for kids. The best season to see the snow on Annapurna Base Camp trek has 2 season September to December & March to May where you can see a lot of snow-clad you can also witness the fresh snowfall at heights if the climate is favorable but if you’re planning to see the snow at large then the Last week of September and first week of December is best. Mobile network on this trek will accesses able in every lodge you can get the wifi in 100-300 NPR and rest you can get the network till Bamboo village. After that, there is no network coverage. The distance of each day would vary as per the campsite location, however, there’s a rough figure of 6-7 hrs you need to cover each day during the trek. Annapurna Base Camp trek is considered as Moderate to difficult trek which can be done by anyone, who is fit to trek. We provide 3 meals a day. Breakfast, Lunch, dinner. The meals will be nutritious in nature and would give you energy for the trek. Your basecamp Phokhara will be your starting point and ending point will be same. You will get this detail while booking of every trek respectively. The sloppy ice treks on Annapurna Base Camp trek make it difficult to walk. You can’t risk taking the preparation for physical strength prior to trek for granted as it may cost you losing your best trek experience. We wouldn’t suggest you to bring as such trekking shoes but if you want something safe and confortable buy waterproof with solid Soule. The trekking shoes give you the needful grip while climbing or crossing the water streams. However on the snow, we would provide you with detachable spikes which will help you to stiffen your grip on the icy slopes during the trek. You need to return these micro spikes attached to your shoes to the trek leaders at the end of the trek at the basecamp or prior to that. We provide you with the vegetarian food that’s full of nutrition that would fulfill all your energy requirements during the trek. We avoid serving junk during the trek as it may lead to gastro-intestinal issues in the trekkers. Yes, But you need to be physically fit to trek and have stamina to trek 6-7 hrs a day. Well this is teahouse base trek so you can take bath in your guesthouses. But the last 2 days will be on trek so there will not be possible to provide the facility. But you can get trekking Shoes and other equipment on rent directly from the marking in Phokhara. Returning to the home with the mystical memories would probably be the best feeling after the trek. Your Trek will end at Phokhara in our guest house, to return you will take a cab from Phokhara and then same way you reach there. Yes, this is teahouse base trek so you can fill your bottels on guesthouse or rest water source is natural streams, rivers and water springs in the mountains and it is safe to drink. Indian currency and shopping cards are acceptable? Yes, Credit & visa cards are acceptable but Debit cards are not acceptable. We would rather suggest you to bring cash along with you and reduce unnecessary expenses. What will be the total expense for a Annapurna Base Camp trek? The total expenses of the trek will be 19,800 INR per person. In addition to that an additional of 5 per cent of the GST will be levied on the total cost.